In the last pygame tutorial we wrote a functional, but not very interesting worm game. In this tutorial and the next I will making various small improvements to the game. After that, I will finally leave the worm game and move on to other things. There will still be improvements to make, but those will be left as an exercise for you. This draws a square at the point (x, y). The width and the height are both 3 pixels. The final zero is the line width. A line width of zero draws a filled rectangle, which is what we want here. This will check if the point (x, y) is a point within the food square. The method will return True if this is the case, or False if it isn’t. For each key, there is one extra test here. This should not be difficult to understand. Our little game could do with some optimization. The call to screen.fill() each time we run the loop slows the game down quite a bit. Also, since we are redrawing entire worm all the game should get just a little bit slower each time the worm’s length increases. Of course, we have to remember to call the erase() method each time the worm eats the food. Let’s make the worm make a chomping sound any time it eats the food. To do this we first have to initialize the mixer and load a sample. You can search on the ‘Net for a sound file, or if you have a microphone, record your own, using software like sox. I recorded myself saying “GULP!” and saved the file as chomp.wav in the same directory as the worm game. It’s a good idea to make sure that the sound is short. Once we have done this, the variable chomp will hold a Sound object that we can play when we want to. In our case that is any time the worm eats the food. 3 # A simple worm game, 2nd attempt. 44 """ Move the worm. """ 1. If you play the game for a while you will notice that from time to time the food gets placed in a location where you cannot reach it. This happens when the food is placed at the right side or the bottom of the game screen. Why is that? What modification do you have to make to the Food constructor to prevent this from happening? 2. Modify the keyboard handler to only use the left and right keys. Pressing right should change the mouse direction clock-wise. Left will change the direction counter-clockwise. 3. Give the game a different background than black. 4. Notice how Food.erase() can result in the worm being “cut”. Change the game so that any time the food is eaten, after the call to Food.erase() the entire worm gets redrawn. You may want to have add an optional flag argument to Worm.draw(). If the flag is true, the entire worm is redrawn. Otherwise only the first and last pixels are drawn. 5. Add a sound when the worm crashes. 6. We increased the size of the food by drawing rectangles instead of pixels. Could the same be applied to the worm? Experiment with this and see what the issues are, if any. In the previous tutorial we learned how to plot individual pixels. We wrote a simple program where you move a pixel around the screen. Today we are going to turn our single pixel into a worm. Two classic games that could easily be built from what we will look at today are “the worm game” and Tron. In this tutorial we will learn how to create the worm itself, and in the next tutorial we will turn it all into a little game that we can actually play. Our worm will move across the screen. We can control it with the cursor keys. There are two things are worm must avoid at all costs: the screen borders and itself. The following code implements just that. 3 # Move a worm across the screen. Beware of borders and self! 8 """ A worm. """ 21 """ Handle key events that affect the worm. """ 36 """ Move the worm. """ The body of the worm is stored in a list. Each time we move one step, we insert the new position of the body into the beginning of the list and pop off the last list item. That keeps our worm constant in length. Actually, that is not entirely true. Our worm starts off being only a single pixel long. We have a bit of extra code that allows the worm to grow to its full length. A little bit of code analysis should make that clear. The move() method also contains a check to see if the worm has crashed onto itself. What we do is see if the position of the worm’s head (self.x, self.y) happens to be at the same place as any part of the worm’s body, by comparing (self.x, self.y) with each position in the body list. The draw() method simply plots all the points held in the body list. The main program should be fairly straight-forward by now. Notice that in addition to checking if the worm has crashed onto any of the borders, the worm object is also asked if it has crashed with itself. Let the worm grow over time. You could for instance have a counter that decreases every frame, or every time the worm turns or whatever. When the counter reaches zero, you increase the length of the worm. Create a program that displays two worms. What changes do you need to make to the Worm class in order for this to work? Modify the worm to have a gradient effect. The head of the mouse should be white. Each body segment should gradually become darker and darker shades of gray. In our first example, we checked if the worm had collided with itself by comparing the position of the worm’s head with all the positions of the body. That worked fine, but there are instances where it’s not practical to keep a lot of positions in a list. An example would be the Tron game that I referred to earlier. The more you move, the longer the list would be, and the longer it would take to determine whether or the object has collided with its own body. We will try a slightly different approach, by using Surface.get_at, which tells us the color of the pixel at the given position. It actually returns (red, green, blue, alpha), but we won’t worry about the alpha part just yet. 19 """ Handle keyboard events that affect the worm. """ 34 """ Move the mouse. """ 48 """ Draw the worm. """ As you can see, the new version is similar to the previous one for most part. Where it does differ is in the part where we detect whether or not the worm has collided with itself. We no longer need to compare the position of the head with each position of the body. Instead we simply compare the color of the pixel where the head is with the color of the background. If they don’t match then we have a collision, since the worm is the only object on the screen. There is one other difference between the programs. In the event loop, look at the order in which the w.draw() and w.move() are in each program. Notice the difference? In order for the second program to be able to work at all, it is vital that we draw that worm before we move it. Think about it for a while and you will understand why. Change the program to compare the pixel color at the worm’s head with the worm’s body color instead of the background color. If the color of the pixel is the same as that of the body it is a crash. Add obstacles around the screen. These should be randomly positioned pixels. Use a different color than the worm’s color. Add collision detection to determine if the worm has crashed onto one of the obstacles. If so, the program should exit. Give the worm food to eat. Food should be a pixel randomly positioned on the screen. Make it a different color from both obstacles and the worm itself. Any time the worm gets the food, the message “yummy” should be printed to the console and a new food should be generated. Keep a counter that increases every time the worm grabs a food item. As a game developer, one thing you will have to get used to is spending hours with your code looking for places to optimize. What I’m going to do here is very trivial, but then again, we are working with a very trivial example. 3 # Move a worm around the screen. Beware of borders and self! 22 """ Handle keyboard events that affect the worm. """ 37 """ Move the mouse. """ 53 """ Draw the worm """
Study the move() and draw() methods and compare them to the ones in the previous version. Also notice that there is no longer any screen.fill() call inside the event loop. I have rearranged some of the code in the move() method. Is this necessary? Figure it out. You can always try rearranging lines to see what happens. You will learn much by experimenting with the code. Analyze the last version of the worm program. How does it differ from the previous one? How does it work? In what ways can this said to be “optimized” as compared to the previous versions? Extend the worm program that draws food for the worm to eat in such a way that each time the worm eats food it grows a little longer. Extend the program in the previous exercise so that there is “poison mushroom” as well as food on the screen. If the worm eats one of these, it reduces in length. If the length goes below a certain minimum, the program should end. That brings to end another pygame tutorial. I hope you enjoyed it. I know that I am moving way too slow for some people. There are loads of other good tutorials out there if you are in a hurry to learn. Many (all?) of them are far superior to my own. Welcome to pygame tutorial #5. This time we’ll look at how to plot individual pixels. We will also look at a keyboard event that may prove useful when we get to the stage of actually being able to write games. You can use Surface.set_at() to plot a single pixel on your surface. You will need to provide the pixel coordinates as well as the color you want to use. An example will (hopefully) make this clear. 3 # Plot random pixels on the screen. This program just plots random pixels until the window is closed. It should be fairly straight-forward. Modify the program above to take the window dimensions as command line arguments. Modify the program to start with a different background color. Write a program that contains a list of 16 preset colors. You can choose any colors you want, but red, green, blue, yellow, brown and purple are a few good ones. Create a program that plots pixels and random coordinates and uses random colors out of the preset list of colors only. Write a program that plots a pixel and the mouse position when the user presses the left mouse button. You have learned how to deal with the QUIT event as well as MOUSEMOVE, MOUSEBUTTONDOWN and MOUSEBUTTONUP. This time let’s look at the KEYDOWN event. This even occurs when the user presses a key down. When we recieve a KEYDOWN event, the event object will hold the code of the key that was pressed in an attribute called ‘key’. So by comparing event.key to whichever key we are interested in, we can find out if that was the actual key that was pressed. As usual, since I’m not good at explaining things, I hope the code below will make it clear. 3 # Move a single pixel around the screen without crashing against the borders. 11 # Position of the pixel. 15 # Direction of the pixel. This program moves a pixel along the screen. Using the cursor keys you can change the direction of the pixel. If the pixel hits any of the borders the program terminates. Notice that keep a track not only of the x and y coordinates, but also the horizontal and vertical direction. When you need to keep track of several attributes of a single “thing” like this, that thing is definitely a candidate for being turned into a class. In order to get used to moving “things” out into being classes, let’s take a look at an example of this. The following example looks and behaves just like the previous one, but there is a difference. We now create a class called MovingPixel. This class is responsible for keeping its own internal state (it’s current position, horizontal and vertical direction, etc). We could have added many more attributes to the class, but for the time being we keep things as simple as possible. The class also contains a few methods in order for the main program to communicate to the class to perform certain actions, such as change direction, draw itself onto the specified surface and so on. All in all, our program has grown slightly longer. But notice that the main program has grown a little less complex because we moved some things that are internal to the pixel into the MovingPixel class. This example is obviouly very simplistic and I don’t necessarily recommend that you create classes to represent pixels (although to be fair, ours is a moving pixel). But the principle can be used on more complex objects that maybe require many drawing operations to draw. We will see more on these in future tutorials. 7 # These are used for directions. 14 """ A moving pixel class. """ 17 """ Creates a moving pixel. """ 24 """ Changes the pixels direction. """ 28 """ Moves the pixel. """ 43 # Create a moving pixel. Modify the above program so that the pixel can move diagonally as well. You could use q (K_q) for up/left, e (K_e) for up/right, y (K_y) for down/left and c (K_c) for down/right. See if you can figure out how to make the pixel leave a trail. See if you can figure out how to turn the pixel into a worm. Choose a length for the worm and make sure the body always follows the head of the worm (as it does in all those worm games. We have reached the end of another tutorial. This one is maybe a little shorter than some of the previous ones. I think its better to keep each tutorial short and instead try to write them more frequently. What do you think? Please let me know. We can have a whole lot of fun with pixels. In the next tutorial we will continue with pixels a bit more but also combine them with a few other drawing methods. We will look at the simplest form of collision detection which allows you to determine if two objects are in contact with each other. That could represent a crash, or the fact that the player has been “caught” or whatever. In the last tutorial, you learned how to draw lines. This time we will deal with mouse events. As usual we will keep it simple. Most of the code should look familiar by now. What is new is the check to see if we have an event of the type MOUSEMOTION (line 13). Also notice that if the event is a mouse motion event we can get a little bit more information out of the Event object. In the next line (14), we use call event.pos to get the current coordinates of the mouse pointer. This method returns a pair of values representing the x-position and y-position of the mouse pointer. Note that the values returned by event.pos are relative to the top left-hand corner of the window, not the entire screen (unless, of course, the window covers the entire screen). You probably already know that the top-left hand corner is (0, 0) in screen coordinates. Write a program that prints the position of the mouse pointer using Cartesian coordinates. To begin with assume that the x-axis is at half the height of the window and the the y-axis is located at half the width of the window. You already know how to draw lines, so you might as well draw the axes. Take care with the difference in direction along the y-axis between screen coordinates and Cartesian coordinates. Replace MOUSEMOTION in the example above with MOUSEBUTTONDOWN. Run the program. Move the mouse over the window and press any mouse button. What happens? Imagine that your window consists of tiles, each one 32×32 pixels. Write a program that detects the current mouse position, translates the screen coordinates into tile coordinates and prints this. Write a program that calculates the distance of the mouse pointer from the center of the window. Remember that there is an imaginary straight line from the center point to the point where the mouse pointer is located. Just calculate the length of the straight line. Seeing screen coordinates dumped onto you terminal window is exciting for just about 0.02 seconds. Let’s do something else. Since what we have learned so far is drawing lines we will stick to that. 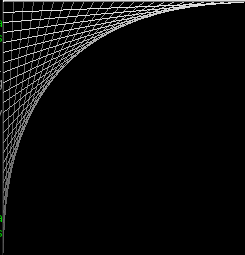 Here is a program that draws lines that cut the mouse pointer’s coordinates. In the examples above, the program draws lines that extend the full width and the height of the window. Create a program that draws a much smaller ‘+’, say from 10 pixels to the left/top of the mouse pointer to 10 pixels to the right/below the pointer. Write a program that draws a horizontal line at the y-coordinate of the mouse pointer. The color of the line should vary according to the following: divide the window into four quadrants. Check which of the quadrants the pointer is in and set the line color to red if it is in the first quadrant, green if it is in the second quadrant, blue if in the third quadrant or white if the mouse pointer is in the last quadrant. Write a program that tracks the positon of the mouse pointer and draws one line from the bottom right right-hand corner of the window to the current mouse position as well as one line from the bottom left-hand corner of the window to the position of the mouse pointer. If you have been doing the exercises so far then you already know how to deal with a mouse button being pressed. Let’s look at an example. In this example we handle the two events MOUSEBUTTONDOWN and MOUSEBUTTONUP. Run the program and try this. Press the left mouse button down. While holding the button down, move it to a different position, the release the mouse button. Good, now you know how that works. Write a program that draws a horizontal line and a vertical line that both intersect the position of the mouse pointer. The color of the lines should change every time the left button is clicked. The vertical line should be set to a new random color. After generating a random color value, make sure that it is different from the current color. The horizontal line should be set to the previous color of the vertical line. Write a program that draws a ‘+’ surrounding the mouse pointer when it is pressed down. The size of the cross should be 20 pixels in each direction. When the mouse button is released the cross should disappear. In this tutorial you have learned how to deal with mouse motion and mouse button state. I think you are now comfortable enough with what events that we can look into them into some detail. Up to now we have been using poll() to get an event off the event queue, for the sake of simplicity. In the next tutorial you will see why that is not really a good idea and what you should do instead. Don’t worry, it won’t really become more complicated. We will also learn a few more drawing methods. Welcome to part 2 in my pygame tutorial. This time we will build upon what you learned last time as we start drawing onto surfaces. We will continue to move very slowly so that everybody gets a chance to learn. You draw a line by using pygame.draw.line. You can also use pygame.draw.aaline which draws an anti-aliased line. Using anti-aliasing can make the line appear less jagged in some cases at the expense of the function call being much slower. This is will do exactly the same thing as the previous example, but is (possibly) more readable. Let’s try to put this together to a little program. We will draw two diagonal lines: one going from the top left-hand corner to the bottom right-hand corner and one from the top right-hand corner to the bottom left-hand corner. We will use pygame.draw.line for one of the lines and pygame.draw.aaline for the other. I hope you recognize most of the code from the first tutorial. If you run the program you should see a big blue ‘x’ across the window. Improve the program by getting rid of “magic numbers”. Declare two variables width and height and initialize them to the width and the height of the window. Then modify the rest of the program to use these variables instead of actual numbers. To verify that you have made all the required changes, try setting width and height to different values and confirm that you still get two diagonal lines and that each line’s end points are at one of the corners of the window. Improve the program further by declaring variables called linecolor, topleft, bottomright and so on. Modify the program to make use of the variables. Modify the program to draw the two lines in different colors. Write a program that instead draws one horizontal and one vertical line. The lines should both be centered. Write a program that draws four lines: the diagonal lines as in the example as well has the horizontal and vertical lines as in the last exercise. Each line should be in a different color. The program should take the height and width of the window as command-line arguments. Once you have solved it for the upper left hand corner, repeat it so that the same pattern is drawn in all four corners of the screen. You should be able to draw all in all corners with a single loop and four calls to pygame.draw.line. Now that we know how to draw lines on the screen with pygame, let’s start moving them around. Moving lines around is simple. we store the line coordinates in variables. Inside the event loop we modify the values of those variables. Let’s draw a line that jumps up and down. There we go. The y-position of the line is determined by the variable y which increased by dir in each iteration of the event loop. The value of dir is 1 when the line is moving downwards, or -1 when the line is moving upwards. Simple, isn’t it? Comment out the line screen.fill(bgcolor) and run the program. What happens? Extend the program to also include a vertical line that moves across the screen. Our final example for today will draw a single color bar (“copper bar” if you’ve ever owned an Amiga). Just like our last example, this one will also jump. In this example I create an array called colorbar (for the lack of a better name). This will hold values for the colorbar as it shifts from black to bright blue and back to black. Keep in mind that a color is composed of red, green and blue. Each one of these can be a value between 0 and 255. If I change the blue value by one for each new line, I would get a really smooth gradient bar. But, the height would be 256 pixels from black to blue and another 256 pixels from blue back to black = 512 pixels, which is too high. There would hardly be enough space in our window to see the bar moving up and down. So I have to decide on a bar height that I find acceptable. I settled on 124, which means I have 62 pixels from the black to blue gradient and another 62 for the blue to black gradient. This also means that I have to move from a blue value of 1 to a blue value of 255 in 62 pixels. The change in blue per line must be 4 per line. I use two for loops to populate the barcolor array. The first loop pushes increasing values of blue to the array and the second one decreasing values of blue. It is important to notice that this array is nothing other than a lookup. It doesn’t contain the bar as you see it on the screen. It just contains color values. Run it and see what it looks like. Once you’ve seen it run, analyze the code and make sure you understand exactly how it works. Then start experimenting with it. The color bar example code is horrible. Full of “magic numbers” everywhere! Fix it. Try using pygame.draw.aaline for drawing the lines. Run the program. Do you notice any difference in speed? Change the color of the color bar. Write a program that draws three color bars in different colors. Take note of the height per bar, so that all three can fit and have some space for movement. In this tutorial you have learned to draw lines. We will be staying with methods of drawing to the screen a little while longer, before we move on to other interesting things like loading and displaying images. In the next tutorial you will also learn a bit about mouse events. 2007.12.11:Added explanation of what the colorbar array does in the last example. Thanks to reader Sergy for pointing out that it needed some explanation. This is the first part of my pygame tutorial, aimed at beginners. I will keep it small and simple, meaning I will proceed very slowly. I am not going to go into too much detail. I will explain just about as much as is necessary to get you started. You will need to have the pygame documentation available. Always keep it open while you are going through this tutorial. One little thing before we begin. I am chronically lazy. It is amazing that I even manage to get out of bed every day. So please don’t expect this to be a regular thing. I will write tutorials as and when my eyes are open. Python: I am using Python 2.4 which is the default Python version on Debian Etch. Other versions will work as well. Pygame: There really isn’t much point in programming in pygame unless you have it installed. A text editor: I recommend Vim a powerful editor with an unfortunately bad reputation for being complex. Don’t believe the rumors. They are not true. That will install pygame and all dependencies for you. Other distros and operating systems: both Python and pygame are most likely available in your repositories. Figure out how to install them and you are ready to go. It is a good idea if you at least have some basic knowledge of Python. I guess you could be learning it as you go along, but I will assume that you know how to program in Python already. First of all, let us look at creating a pygame application that does absolutely nothing. Well, nearly absolutely nothing. It actually does display a window. It also does some very rudimentary event handling. You can see this as a template for the next few programs that we will write. First of all, to use pygame we have to import it. Then we create a Surface that is 640 pixels wide and 400 pixels high. There are a lot more things you can do with set_mode, but we will keep it simple at this point. hit CTRL+C to stop the program. We will fix that soon. Create a window that is 320 pixels wide and 200 pixels high. Create a program where the user can specify the width and the height as command line arguments. Create a program that asks the users for the width and the height and then displays the window. Write a program that calls pygame.display.set_mode twice with different sizes. What do you expect should happen? Run the program. What actually happens? Can you explain why? Our first example was maybe a little too simple. Staring at a completely blank window soon gets boring. Also, having to go to the terminal and hit CTRL+C to close the window seems a little awkward. Let’s add a bit of code! What is new is that I have added a simple event loop. The loop is controlled by a flag called running. As long as the flag is set the loop keeps running. Inside the loop we use the poll method to grab the next event from the event queue. There are other ways of doing this, but polling works just fine for now. There are several different event types that pygame knows about and can respond to. One of these is QUIT, which gets triggered when the user clicks on the window’s close button. All we do if we get an event of this type is clear the running flag, which will exit the loop and cause the program to terminate. Still simple, isn’t it. Adapt each of the programs you wrote for the exercises in the previous section to use an event loop. Rewrite the program to do away with the running flag. Make sure that the program still jumps out of the event loop on the QUIT event. We have added just two lines of code. The first one sets a background color for the Surface. We have passed in a sequence of three values: red, green and blue. Each one can be a value between 0 and 255. Since we set all to zero, we get a black screen. You should experiment with different values for red, green and blue. The next thing that is new is that we call pygame.display.flip. Drawing directly to the screen is usually a very bad idea. Instead, we have a invisible buffer that we draw onto. When we have finished drawing we make the buffer visible. That way we get flicker-free animations (when we get to that). Create a window with a white background color. Create a window with a red background color. Experiment with setting different background colors. If you are not familiar with RGB values then spend a little extra time to figure out how to get colors like yellow, brown, cyan etc. Create a program that asks the user to specify the values for red, green and blue. Check that the values are in the valid range (0-255) and then use these for the background color. Create a program that upon start-up checks the time of the day and sets the brightness of the background color accordingly. Use a blue scale. If it is midnight, the screen should be black. If it is midday, the screen should be bright blue. Any other time the background should be something in between corresponding to the brightness outside. So what have you learned so far? Not an awful lot, by the looks of it. But in a way you have. You have acquired some basics that you will need to understand the next tutorial, which will come soon. In the meantime, try your hands on a few of the exercises. If you complete all you can make up a few of your own.